The RRB ALP CBT 2 Final Answer key has been released. The aspirants would be able to check RRB ALP, Technician CBT 2 Final Answer Key 2019 by visiting the regional RRBs official websites. The RRB Group D Computer Based Test was conducted from 21 to 23, January and 08 February2019 for the appointment of 64,371 RRB ALP. The regional websites where the candidates can check the final answer keys is given below. The RRB ALP CBT 2 Final Answer key has been released. The aspirants would be able to check RRB ALP, Technician CBT 2 Final Answer Key 2019 by visiting the regional RRBs official website . 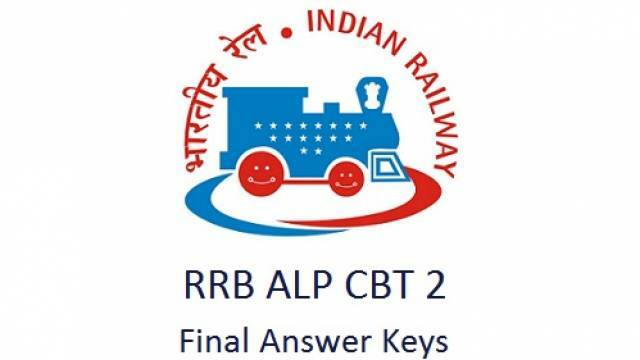 The RRB ALP, Technician CBT 2 Final Answer Key 2019 can be downloaded at the official website, rrbcdg.gov.in. The RRB Group D Computer Based Test was conducted from 21 to 23, January and 08 February2019 for the appointment of 64,371 RRB ALP. The tentative responses & final answer keys was released by the RRB on Febrauray 18, 2019. Candidates were allowed to raise objections till February 20, 2019. Now the RRB has released the final answer key for the RRB ALP CBT 2 Exam 2019. The RRB will release the list of candidates have to appear in Aptitude test for ALP posts on April 06, 2019. And the expected date to conduct the Aptitude Test by the RRB is April 16, 2019. Open the official website of RRB, i.e., rrbcdg.gov.in. Click on the "Provisional Score and Question Paper with Responses & Final Answer Keys link." Fill your Registration Number and Date of Birth as user password. Candidates are advised to download the final answer key for future refrence. Candidates qualifying the 2nd stage computer-based test (CBT) Examination would be eligible to appear for Document Verification. Candidates are requested to regularly follow the official website and Safalta.com education portal to view the latest updates for RRB Recruitment. Following are the regional websites where the candidates can check the final answer keys. List of RRB regional websites mentioned below.